Valletta Mayor Alexiei Dingli, Valletta 2018 Executive Director Catherine Tabone, Parliamentary Secretary Deo Debattista and Minister Owen Bonnici during this morning's Culture Matters seminar. 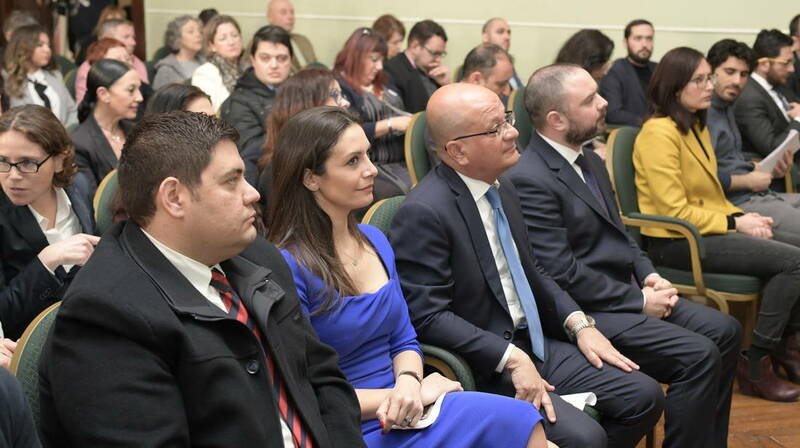 The annual Culture Matters seminar, which presents findings from the Valletta 2018 Foundation’s Evaluation and Monitoring research into the impacts of the European Capital of Culture title, was opened earlier this morning by Valletta 2018 Executive Director Catherine Tabone, Parliamentary Secretary for Consumer Protection and Valletta 2018 Deo Debattista and Minister for Justice, Culture and Local Government Owen Bonnici. Valletta 2018 Executive Director opened the seminar by speaking about the results from the Valletta Participation Survey. “Through Culture Matters, the Valletta 2018 Foundation explores the legacy of the European Capital of Culture title, discussing the initial findings of its Evaluation and Monitoring research. Initial figures show that Valletta is a city that is changing for the better and that there is increased awareness of its rich historical and cultural value. With regard to community inclusion and accessibility, results show that significant progress has been made in terms of physical accessibility. We now look forward to further ensure the community’s involvement, including people with disability, not only as consumers of cultural activity, but also as its producers,” explained Catherine Tabone. “Valletta 2018 is a milestone because it is also the spark leading to the formation of an agency that will carry forward Valletta as the Culture Capital of Europe beyond the end of this year. This agency will support the legacy of Valletta 2018 for our future generations. All that we have achieved in this sector with hard work and determination should be enjoyed, and bettered for our children. All of this, and so much more, is a clear example of how much this Government believes in this sector,” said Minister Bonnici. “Over 400 events are taking place in Malta, with more than 40 in Gozo, in schools, band clubs, and squares, and are relying on the inclusion of our audiences. Audience participation is an ever-growing crucial phenomenon in the cultural sector, which we must continue to invest in by bringing interactive cultural events to our islands, and assuring high-quality performances in our theatres, squares, and community spaces,” said Parliamentary Secretary Debattista. The Economic Policy Department has also noted that the culture sector stands at 7% of the Gross Value Added, surpassing the construction and civil sector, and the accommodation and food services sector, both registering 4% and 5% of the Gross Value Added respectively. Research by Jobsplus also show that investment in the cultural sector is also reflected in the job creation within the sector, in which employment within the cultural industry represents about 5.37% of employment in the total economy. There has also been a steady rising in the number of tourists visiting the islands and staying in Valletta, as reported by the Malta Tourism Authority. The Valletta 2018 Evaluation and Monitoring research also comprises studies investigating impacts of the European Capital of Culture title on urban development, community inclusion, cultural participation and European identity, amongst others. The Evaluation and Monitoring Research is conducted by NSO, MTA, Jobsplus and the EPD, within the Ministry for Finance, and five independently appointed researchers and is conducted by the Foundation’s Research department.